One of the few things that give me hope for our country is CHILDREN. Something happened at mass today. A pretty, little girl was roaming around the church while her parents listened to the priest. Then, she began smiling and waving at me. 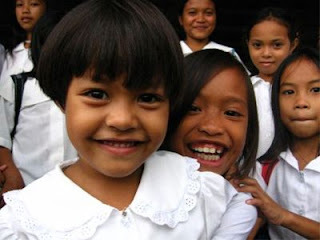 I love children, so it was only natural for me to wave and smile back while listening to the mass. Before Consecration, the little girl embraced her family---and then suddenly embraced me, ---a complete stranger. Despite my love for children, no child has ever done that to me---and I knew that pretty, little girl is very special. Until now, I kept on thinking why that happened. Theories like she is friendly or that she just likes women occurred to me---when I realize there are no theories at all. That child made me realize that there is hope for our country through children. And maybe that is the reason why I love kids so much. They bring light to the darkness that surrounds us. Some of you may say that kids are brats and when they grow up, it's like "all hell broke loose". But come on, they are kids and I think that’s normal. They are one of the reasons why I do not give up on our country. The children are the future of our country. As cliche as that sounds, sometimes cliches will help our country from getting up when it falls. Whether you love children or now, it is up to us adults to take care of them and help them grow up, so they change our country. Do you love children? Let me know by leaving a comment below. You can also talk to me on Facebook, Twitter, and Instagram.